Our medical team will obtain confidential information as part of our care for patients. We keep records about our patient’s health, treatment and care they have receive from us. The records may be written down (manual records) and/or held in a secure digital format. All our staff have a legal duty to keep information about patients safe and confidential within the Data Protection Act (1998), General Data Protection Regulation (GDPR) and other relevant healthcare regulations within the NHS, such as the Records Management Code of Practice for Health and Social Care 2016. We will only ever pass on information gathered about our patients if others involved in their care have a genuine need for it. For example, a copy of the patient record is handed over to the receiving hospital so treatment and can be continued safely and without delay. In addition, a copy of our patients care record is retained by the East of England Ambulance Service NHS Trust; they are the responsible body for pre-hospital care in the East of England and we respond on their behalf. We will not disclose your information to other third parties without your permission unless there are exceptional circumstances, such as when the health or safety of others is at risk or where the law requires information to be passed on. The Data Protection Act 1998 allows you to find out what information about you is held on computer and in certain manual records. This is known as “right of subject access”. It applies to your health records. You are entitled to receive a copy, but you should also be aware that in certain circumstances your right to see some details in your health records may be limited in your own interest or for other reasons. Follow-up information on your in-hospital care, diagnosis and interventions. Contact Patient / Next of Kin for clinical & wellbeing follow-up (where consent has been given). Ensure compliance with our Safeguarding Policy. Ensure health records are accurate & complete and compliant with relevant Data Protection Regulation and NHS Records Management Code of Practice. Our Patient Liaison Managers may contact patients / their next of kin for the purpose follow-up and support. Follow-up information may be entered into the existing secure patient care record. Patients / their next of kin will not be contacted for promotion or marketing purposes. The Patient Liaison Managers may contact bereaved families by letter to offer condolences and to provide an opportunity for dialogue between the family and the PLMs. For us equality and diversity is part and parcel of everything that we do. As outlined in the Subject Access Code of Practice from the Information Commissioners Office, patients have a right of access to their personal data, such as the record of their care created by us. To request a copy of your health record recorded by us, please contact [email protected]. Please note, some exemptions apply and these will be reviewed on a case by case basis. We want our patients and the people we serve to receive the very best care at all times. If you feel a mistake or misunderstanding has occurred in the care we have provided, we’d like to hear from you. In this way we can help to resolve your concerns and ensure that we learn from any mistakes. 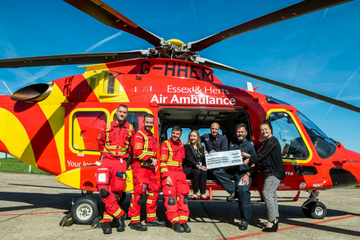 We hope that we can resolve any concerns or queries you may have informally, however, if you are unhappy with the treatment or service you have received from Essex & Herts Air Ambulance Trust, or are unhappy with the answers you have received informally, you may wish to make a formal complaint. We may even suggest that this is the best course of action in order to resolve your particular concern. If you make a formal complaint we will endeavour to send you an acknowledgement within three working days of receipt and a full written response outlining the findings of our investigations within 25 working days. Should these timescales not be possible, we will keep you informed about the reasons why and advise when you can expect to receive a response. If we suspect that we have not operated to our very high standards and an incident has occurred that may have caused harm, we will be open and truthful and follow our Duty of Candour to ensure you are notified in a timely manner. We will carry out a thorough investigation, keeping you informed and learning from lessons, to ensure patient care and safety are paramount and the same mistake is not made again. Help you think about whether you are happy with the responses you receive. ICAS will not try to persuade you to do, or not do, anything and will always respect your decisions. ICAS in the South East of England is provided by South of England Advocacy Projects (SEAP) who can be contacted via their website.